I must say that I was pleasantly surprised about the swine flu video for 2 reasons – first that it is directed at students, not adults (as all BrainPOP videos are), and secondly, the treatment of the vocabulary in the video is excellent. Any key vocabulary term used in the video is displayed clearly as the conversation ensues. The video displayed while the vocabulary is on the screen gives visual cues to what the term means. This provides reinforcement for the key points, and develops vocabulary skills. You can also check out the BrainPOP section on Swine Flu or BrainPOP Jr. video on Hand Washing. Hello video announcements crew! I just finished a workshop at Amherst Middle with Mr. Z. on using Visual Communicator. Click on the video below to see some of what I learned. Let me know what you think, and see you in August! Posted on Thursday, 17 July 2008 Categories Video4 Comments on Hello Crew! Three students from Heim recently won the Generation YES Go Green video contest. In the contest, students were directed to produce a video about how our school is Green and/or how it could be better at it. In the GenYES spirit, all aspects had to be student-driven. I can tell you without a doubt it was, and doing so proves how much our students can do given the right resources. Once Caroline was approached about this contest by Mrs. Merlino, she immediately enlisted Mary and Kelly to join in. The only time I heard from them is when they needed a resource, or some guidance in how to do something. They did it all, and a fine job they did. See the winning video at the Generation YES site here, along with the other talented student winners from California. Their videos will be featured at the National Educational Computing Conference in San Antonio June 29-July 2. Bravo, Ladies! We recently completed a video project with one of our social studies teachers. This 7th grade project involved students picking one topic from the curriculum, and interpreting it with video in some form. We showed the students some samples from TeacherTube, including some done locally in a Buffalo high school. We then set them loose with teams, storyboards, equipment, and guidance. What I love about video projects is that since the focus is on performing knowledge, rather than just repeating knowledge, you get a better picture of what the students really know. While this can be either rewarding or scary, it still gets to the deeper understandings they have. Quite a few different classes have created video projects this year, with some exciting results. I’m looking forward to many more next year! 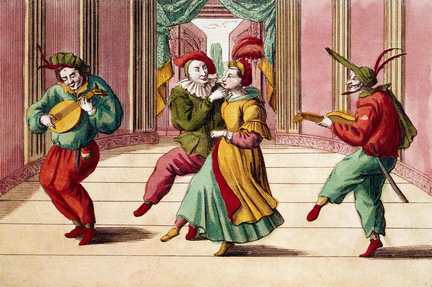 18th-Century Engraving of Commedia Dell’arte Actors on Stage. Corbis. 2006. In the mean time, the students motivated me to create my own piece. I chose to write a reflective poem about one of my favorite books that I just re-read, Jonathan Livingston Seagull. I also wrote a little refelction on my Shelfari page about the book. How is it possible we want the same things? I was at a friend’s house over the weekend for a suprise party. They have a brand new HD camcorder that I noticed on the counter. You know how sometimes you see something, pick it up, and get that OH WOW feeling? Well that’s just what I got with this baby…it’s a JVC Everio GZ-HD3, 60 GB hard drive, HD camcorder. It is amazing to see what a (comparatively) small amount of money will buy in camcorders these days. We paid the same, or more, for cameras just a few years ago that do not hold a candle to what this has on board. The HD movement in video, and digital broadcasting of all TV by next year, has lots of implications for how we move forward in schools. We have no equipment that truly supports the new video standards. A camcorder such as this JVC model would be the tip of a huge iceberg in terms of the type of equipment we would need to realize its potential. While we begin to think about that, I’ll have my nose pressed up against the store window drooling at this delightful piece of technology! 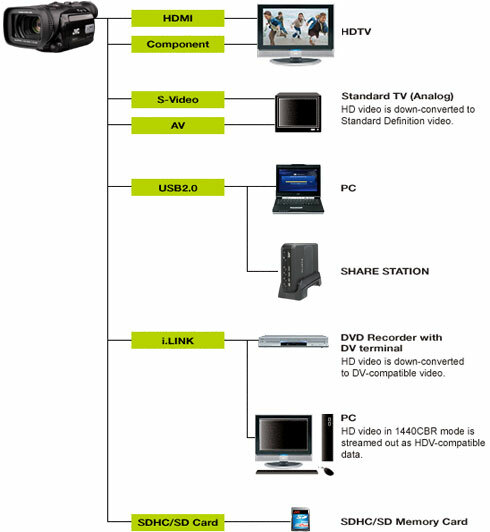 “Everio GZ-HD3.” JVC Video Camcorder Site. JVC Corp. 8 Mar. 2008 <http://camcorder.jvc.com/index.jsp>. Path: Everio High Definition; GZ-HD3. This video was created in January of 2008, but not posted to this site until March of 2015. This is one of my creations, a tribute to the principal of Heim Middle School who was retiring. The video represents so much of what I enjoy about video, and the power it has to tell stories. When tasked with a project like this, there is only so much time and resources available. I find that video comes together much more easily with some sort of story or angle. In this case it was the walk-through. Mr. Kramer could always be found walking the halls, checking on what was going on in the building. Using that framework, the idea for “walking” the building, capturing interviews and stills, came to life. Many of the clips that made the final cut were off-the-cuff interviews by those involved. Editing this piece became a lot of fun. The secret sauce that brings it all together is the music, not surprisingly. It is amazing how music that sets the right mood really helps video transcend into another level. The entire clip is about 11 minutes. There are some very funny spots, and some emotional ones. Every time I watch it I think about how some transitions could be different, or some edits could have made for smoother flow. But, every time I watch it, I think the story really is powerful. Especially the closing couple of minutes beginning with the tribute on the scrolling digital sign. Chuck Kramer did great things at Heim Middle – here is a brief tribute to his time there – I hope you enjoy it. Click the link below to be taken to the video. Now that you have finished your French video project on shopping, take a few mintues to reflect and respond to the following questions. Did your French speaking get significantly better by doing this project? Was it easier or harder than if we just did a speaking piece in class? Was there more value doing this project as a movie than doing it as a skit in the classroom? Your honest feedback is just fine (meaning you won’t hurt our feelings). Please use complete sentences and thoughts – no chat language, please! Now that we have finished the personal narrative piece in ELA incorporating digital storytelling, please take a few minutes to answer the following questions. Do you think your writing improved as a result of this project? Give at least two reasons why or why not. How was this project different than if we simply wrote a personal narrative? Would you want to do something like this again?